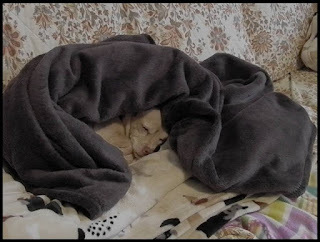 Of course, for the first time in several weeks, I was sleeping sound. These advisories came in at 3:30 a.m. I still had a half hour before my alarm went off. I got up. Got a jump start on making a hot breakfast for Lisa and packing her work lunch. Planned out my day. Creating a new homemade dog treat recipe. Baking homemade biscuits for our kids. Baking work snacks and breakfast pastry for Lisa. Meal prep for our kids. Meal prep for Lisa and myself. Work stuff. Housework. The usual stuff and a little extra just in case we lose power. A few hours into my Work At Home Dog Mom Day, I came across this cartoon. I have no shame in admitting that it made me cry. 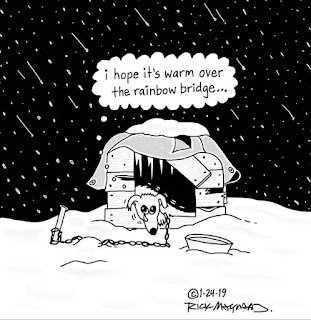 Year after year after year, I come across photos and stories on my social media streams about dogs who are left outdoors during extreme cold snaps. This year, Mother Nature is doling out some brutal cold weather. In the Midwest right now, they're dealing with temps 40-60 BELOW 0. Later today, our temps are going to drop and the wind is going to pick up. From that point on through Friday morning, our temps will be 10-25 BELOW 0. It's cold enough to kill humans. It's more than cold enough to kill furry kids if they're left outdoors for any length of time. DO NOT leave your pets outdoors for more than a few minutes. DO NOT leave them outdoors unattended. DO NOT assume that because they have fur they can endure extreme cold. If you leave them outdoors, they will freeze to death. And, if you see something, say something.